In what was immediately heralded as a victory for the grassroots, Senate Democrats on Tuesday stymied President Barack Obama’s corporate-driven trade agenda by voting to prevent the chamber from taking up Fast Track legislation. According to news reports, a cloture motion to cut off a filibuster and proceed to debate fell short of the 60 votes necessary to pass. Sen. Tom Carper, of Delaware, was the only Democrat to vote yes. 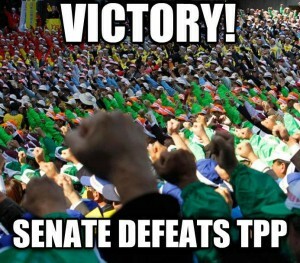 Civil society groups lauded Tuesday’s outcome and what it could mean for future trade votes. Still, now is not the time for the grassroots to become complacent, warned Democracy for America executive director Charles Chamberlain in a statement released just after the vote.